As satellite communications becomes more competitive and technology moves ahead rapidly, the need for consultancy services becomes a necessity to ensure that a company gets the most benefit from the selection and implementation of a new satellite based telecommunications network. Servicesat can deliver consultancy services to enable you to quickly address your telecommunications needs by selecting the right technology at the right price. Servicesat has the experience to assist in simplifying the complicated decisions that need to be made when selecting a satellite based telecommunications network. Our engineers have designed satellite based networks that include pipeline and river water management control, banking, back office management, FM radio distribution, lottery terminal control, security camera and remote alarm management. There has not been a single telecommunications requirement for which Servicesat was unable to find an efficient and cost effective solution. Helping you select the right product and service. Assisting in the implementation of the new products and services. Providing on going support for the life of the project. The Servicesat Radio-Station Long-Range-Distribution Solution is designed for radio stations that want to expand their coverage to a national or even international level. Servicesat offers a wide range of connection packages for telemetry, monitoring and remote control of Wind Parks and Solar Farms. In collaboration with renowned companies operating in the area of security systems, Servicesat also proposes complete protection and security solutions. VSAT (Very Small Aperture Terminal) satellite links can be used in the security sector to provide Reliable, Secure and Very Affordable network connectivity to installations that even terrestrial and/or cell 3G services are very difficult to reach. They can be used to ensure that the security needs for remote management, monitoring, intrusion detection, camera feeds, etc, are satisfied. 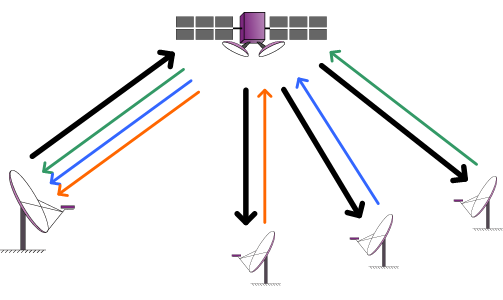 A star topology network consists of one central location, usually the HQ of the company or the central location of the GSM network and many remote locations. All remote stations receive a combined stream with all the data transmitted from the HQ. Each remote transmits back data to the HQ through either a dedicated SCPC channel or a TDMA shared channel. Depending on the specific requirements of the customer. 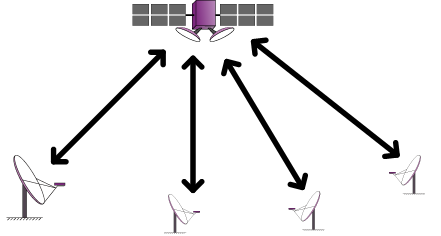 In mesh topology networks all the remotes that participate in the network are fully connected to each other via a single-hop connection. This makes mesh networks ideal for applications where propagation delay is critical, like private VoIP networks or video conference systems. In some cases a star network does not satisfy the technical requirements of a certain project, while a mesh topology becomes too expensive. In cases like that hybrid topologies can be used to satisfy both the technical and financial constraints of a project. 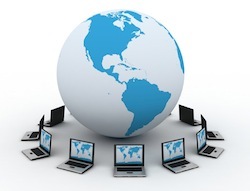 Hybrid topologies are flexible solutions tailored to satisfy the exact needs of the customer.